Prince Itō Hirobumi (伊藤 博文) Itō Hirobumi, October 16, 1841–October 26, 1909), also called Hirofumi, Hakubun Shunsuke, and Toshisuke in his youth, was one of the Meiji Era’s most famous statesmen, Resident-General of Korea, four times Prime Minister of Japan (the first, fifth, seventh and tenth) and genro (elder statesman). As a youth, Itō joined the Sonno joi (“to revere the Emperor and expel the barbarians”) movement. In 1863, he was chosen to be one of the “Chōshū Five” who were sent to study Western naval science at University College in London. The experience in Great Britain convinced him of the necessity of Japan adopting Western ways. On his return to Japan, he led negotiations after the English bombardment of Choshu and convinced the Japanese leaders not to go to war with the foreign powers. After the Meiji Restoration, Ito studied Western financial systems and toured the West with other government officials. In 1883, after extensive research on European political systems, he began drafting Meiji Japan's constitution, based on that of Prussia. He was chosen to be the prime minister of the first cabinet government in 1885, and later began to promote party politics. In 1888, he became head of the privy council, serving four more times as prime minister in 1892-1896, 1898-1899, and 1900-1901, and leading Japan to the status of a world power. After the Sino-Japanese War, he became the first Japanese Resident General in Korea in 1906, forcing the Korean sovereign's abdication in 1907. He resigned in 1909, but was assassinated in Manchuria by a Korean nationalist. Itō Hirobumi was born on October 16, 1841 in Hagi, Chōshū (present day Hikari city in Yamaguchi prefecture. He was a student of Yoshida Shoin at the Shoka Sonjuku, and later joined the Sonno joi (“to revere the Emperor and expel the barbarians”), movement together with Kido Takayoshi, known as Katsura Kogorō (桂小五郎), who became his mentor and was later one of the major leaders in early Meiji Japan. Ito received samurai status in 1863 and was chosen to be one of the “Chōshū Five” who were sent to study Western naval science at University College, London. The experience in Great Britain convinced him of the necessity of Japan adopting Western ways. In 1864, he returned to Japan with fellow student Inoue Kaoru to attempt to warn the Chōshū clan against going to war with England, after the Bombardment of Shimonoseki, over the right of passage through the Straits of Shimonoseki. At that time he met Ernest Satow, later a lifelong friend, for the first time. Through his connections with Kido and Okubo Toshimichi, another leader of early Meiji Japan, Ito was able to visit the United States on government missions, and went to Europe with the Iwakura Mission (1870, 1871–73) to research matters such as taxation and budgetary systems and treaty revision. 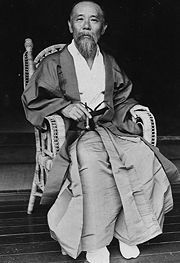 After the Meiji Restoration, Itō was appointed governor of Hyogo Prefecture, junior councilor for Foreign Affairs, and sent to the United States in 1870 to study western currency systems. Returning to Japan in 1871, he established Japan’s taxation system. Later in 1871, he was sent on the Iwakura Mission around the world as vice-envoy extraordinary, during which he won the confidence of Okubo Toshimichi, another leader of the Meiji Restoration. In 1873, Itō was made a full councilor, Minister of Public Works, and (in 1875) chairman of the first Assembly of Prefectural Governors. His political career In 1878, Okubo, the most powerful figure in the government, was assassinated, and Ito took over the post of Home Minister and secured a central position in the Meiji government. His advancement brought him into conflict with the equally talented and ambitious statesman Okuma Shigenobu. In a series of masterful political strokes, Ito forced Okuma Shigenobu to resign in 1881, leaving himself in unchallenged control. He persuaded the government to adopt a constitution which was proclaimed by the Emperor proclaimed in 1889, and in 1890 the bicameral national Diet was established. Ito, then an important person in the Meiji government, and other officials spent nearly 18 months (1882–1883) in Europe, particularly in Germany, studying under leading constitutional scholars. The Meiji constitution, Ito's greatest project, was modeled on the Prussian government. It has been criticized for perpetuating authoritarian rule, because of the restrictions placed on guarantees of civil rights and the powers of the Diet. Considering the samurai background of the Meiji leaders and the political difficulties they faced, however, the acknowledgment in writing of basic rights and the establishment of the Diet were progressive and enlightened acts. While working on a constitution for Japan, Ito also wrote the first Imperial Household Law and established the Japanese peerage system (kazoku) in 1884. In 1885, he negotiated the Convention of Tientsin with Li Hung-chang, normalizing Japan’s diplomatic relations with the Chinese Qing Dynasty. Also in 1885, based on European ideas, Itō established a cabinet system of government, replacing the Dajō-kan as the decision-making state organization, and on December 22, 1885, he became the first Prime Minister of Japan. On April 30, 1888, Itō resigned as Prime Minister, but headed the new Privy Council to maintain power behind the scenes. In 1889, when the Meiji Constitution was promulgated, he also became the first genro(elderly statesman). Itō remained a powerful force while Kuroda Kiyotaka and Yamagata Aritomo were Prime Ministers. During Itō’s second term as Prime Minister, (August 8, 1892 – August 31, 1896) he supported the First Sino-Japanese War. As prime minister, he helped Japan negotiate the Anglo-Japanese Treaty of Commerce and Navigation of 1894, removing some of the onerous unequal treaty clauses that had plagued Japanese foreign relations since the start of the Meiji period. Under the agreement British nationals in Japan became subject to Japanese law by 1899. This agreement was followed by treaties with other major Western nations. After Japan's victory over China in 1895, Itō negotiated the Treaty of Shimonoseki in March 1895 together with his ailing foreign minister Mutsu Munemitsu. These accomplishments were the first clear indications that Japan, alone among non-Western nations, had achieved success in modernization and a strong influence on East Asian affairs. During Itō’s third term as Prime Minister (January 12, 1898 –June 30, 1899), Itō encountered problems with party politics. He perceived, along with other genro, that party politicians were incapable of dealing dispassionately with Japan's welfare and destiny. The powers guaranteed by the new Meiji constitution enabled the political parties to impede government programs in the Diet. Ito unhappily, but with characteristic flexibility, continually worked out compromises with the parties, until 1900 no cabinet could be formed without their tacit consent. The parties had been cooperating with the government in return for cabinet positions and laws favoring party growth. When both the Jiyuto and the Shimpoto parties opposed his proposal for new land taxes, Ito dissolved the Diet in retaliation, and called for new elections. The two parties merged into the Kenseito, won a majority of the seats, and forced Ito to resign. This lesson taught Ito the need for a pro-government political party, so he organized the Rikken Seiyukai in 1900, based on an older antigovernment party, the Kenseito (“Constitutional Association”). The Seiyukai became the first party to control an absolute majority in the House of Representatives during a Diet session, leading Itō to believe that he had finally created the right conditions for smooth passage of government programs. Itō returned to office as Prime Minister for a fourth term from October 19, 1900 – May 10, 1901; this time facing political opposition from the House of Peers. The conservative members of the House of Peers, which Itō had originally created to balance the less responsible House of Representatives, were unhappy with Itō's party alliances and began to use obstructive tactics. Weary of political back-stabbing, Itō resigned in 1901, but remained as head of the Privy Council as the premiership alternated between Saionji Kimmochi and Katsura Taro. Finding that dealing with individual party members, each with promoting his own constituency, was more difficult than working with a handful of genro (elder statemen) who all shared from the same background and vision, he resigned as president of the Rikken Seiyukai in 1903. As a consequence of his activities, Itō lost the loyalty of the genro, and soon Yamagata Aritomo, founder of the modern Japanese army, became the leading power. Itō, however, had succeeded in establishing cooperation between high-ranking bureaucrats and party politicians and ending polarization of these two groups. In November 1905, following the Russo-Japanese War, the Korean government signed the Eulsa Treaty, making Korea a Japanese protectorate. Itō became the first Resident-General of Korea on December 21, 1905. He urged the Korean King Gojong, to abdicate in 1907 in favor of his son King Sunjong. He was unable to prevent the annexation favored by leaders in Japan, and pushed through the Japan-Korea Annexation Treaty of 1907, giving Japan control over Korean internal affairs. Unable to gain the trust and confidence of the Koreans, he resigned on June 14, 1909. Ito was assassinated in October 1909, at Harbin train station in Manchuria by a Korean nationalist, An Jung-geun. His last words, on being told that he was the victim of a political assassination, were, “Baka na yatsu ja!” (“He is a fool!”). Ito probably meant that his assassin had killed the one Japanese leader who had supported, and would have continued to support, an even-handed Korea policy. Itō Hirobumi was on the 1,000 yen note of Japan from 1963 until a new series was issued in 1984. Suematsu Kencho was Itō’s son-in-law, having married his second daughter, Ikuko. Itō Hirobumi’s house is preserved as a museum near the Shoin Jinja, in Hagi city, Yamaguchi prefecture. However, the actual structure was Itō’s second home, formerly located in Shinagawa, Tokyo. Itō Hirobumi’s womanizing was a popular theme in editorial cartoons and in parodies by contemporary comedians. Ito received an honorary doctorate from Yale University. Ito, H. A maker of new Japan: Marquis Ito's experience. The Gwaikokugo Kyojusho, 1904. Biographical material – Notable Names Database. This page was last modified on 9 March 2018, at 18:18.